OCTOBER 21--In a cynical and duplicitous attempt to capitalize on New York City’s documented racial profiling problems, a pair of bloggers have created a video purporting to show an NYPD officer stopping and frisking a pair of Muslim men for the crime of wearing traditional Islamic garments. 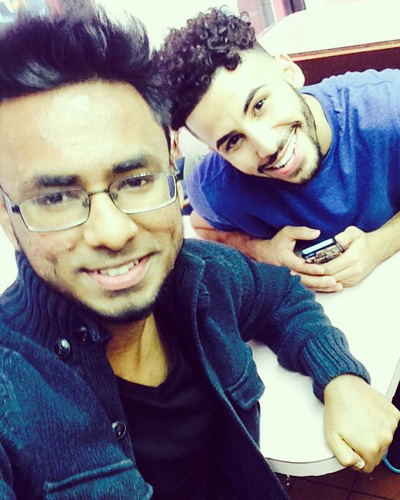 But the viral video is a sham, a staged production aimed to go viral and pile up views and YouTube channel subscriptions for its young creators, Brooklynites Adam Saleh and Sheikh Akbar, who get a piece of the revenue generated by ads that run before their videos play. The duo’s video operation--which is named “TrueStoryASA”--has racked up 60 million YouTube views and has more than 661,000 subscribers on the video-sharing site. While most of the pair’s videos involve pranks, sidewalk attempts at comedy and social commentary, or “Muslim-related stuff,” their latest clip seeks to latch onto an issue that has troubled many New Yorkers and tainted the NYPD. Titled “Racial Profiling Experiment,” the 2:53 video (seen above) was uploaded Sunday to YouTube, where it has already been viewed in excess of 135,000 times. The clip has received coverage in several publications, including the British newspaper The Independent and The Huffington Post. The video opens with Saleh and Akbar loudly arguing as they walk down a Queens street. The men, dressed in jeans and t-shirts, shove each other and appear on the verge of exchanging blows. While this is transpiring, a purported NYPD officer stands just feet away. With his arms folded, the impassive cop--whose face has been blurred--does nothing as the pair seems on the verge of fighting. The scene is apparently being filmed from a parked car by a friend of Saleh and Akbar. Oddly, the officer never bothers to remove the item to confirm that it is a phone and not a deadly weapon. Also, the cop does not appear concerned that Saleh’s friend is hovering directly behind him. The video ends with a request for viewers to give it a “thumbs up” vote on YouTube, as well as a pitch for new subscribers to the duo’s video channel. The purported “Racial Profiling Experiment” undertaken by Saleh and Akbar was filmed on 126th Street in the Willets Point section of Queens, across from Citi Field, home to the New York Mets. The video was shot on a street where many of the businesses--tire outlets, auto repair firms, muffler shops--have been closed or relocated as part of a city redevelopment effort. By obscuring the purported cop’s face, Saleh and Akbar have sought to avoid the immediate debunking of their clip, which has already garnered in excess of 30,000 “thumbs up” on YouTube and more than 5200 comments. In their supposed effort to expose racial profiling, the video’s creators have inexplicably--yet conveniently--provided cover for the rogue patrolman, now an electronically blurred boogeyman. A second source, a recently retired NYPD detective who also watched the “profiling” video at TSG’s request, branded it an “obvious hoax” intended to “smear” police. If that was the intent of Saleh and Akbar, they appear to have succeeded. According to The Huffington Post, the video provides a “small glimpse into the ugly world of racial profiling.” The news site later updated its piece to indicate that the clip’s authenticity could not be verified, and that NYPD officials are reviewing the video. Saleh and Akbar have not responded to TSG messages sent via Facebook, where each man describes himself as an "Actor/Director." However, despite that shaky assurance, the videographers copped to their perfidy (albeit sneakily) after TSG exposed their hoax this morning. They edited the video’s YouTube description to report that the clip was a “Dramatization of previous events that occurred with us in our tradition clothing while filming in NYC. This video is not against the NYPD.” The video’s original description claimed that Saleh and Akbar were prompted to expose the NYPD after “we kept getting followed by Police. So we decided to film this social experiment on racial profiling.” The duo added that, “Too many innocent people get stopped and frisked” daily due to their clothing and skin color.